1. Learn the art of expectation management. "This is the name of the client and employee game; set the tone early and don't allow for expectation to set in. This is best done with a solid scope of work, contract, and a detailed deliverables schedule. The old adage of under-promise and over-deliver always holds true." 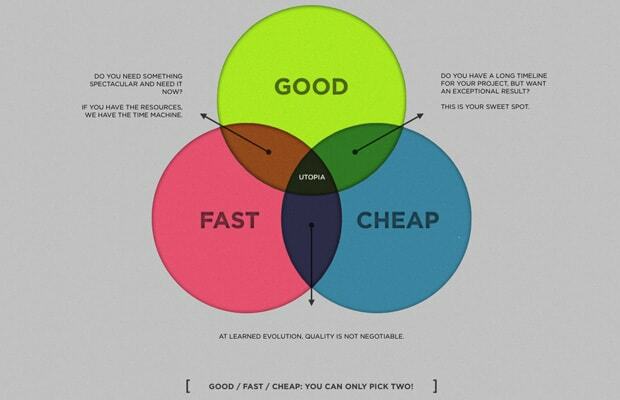 "The 'Good/Cheap/Fast triangle' is one of the best tactics to use for setting expectations when it comes to billing. Here is our custom version that we send to clients, so they understand how we come up with our pricing for their project."